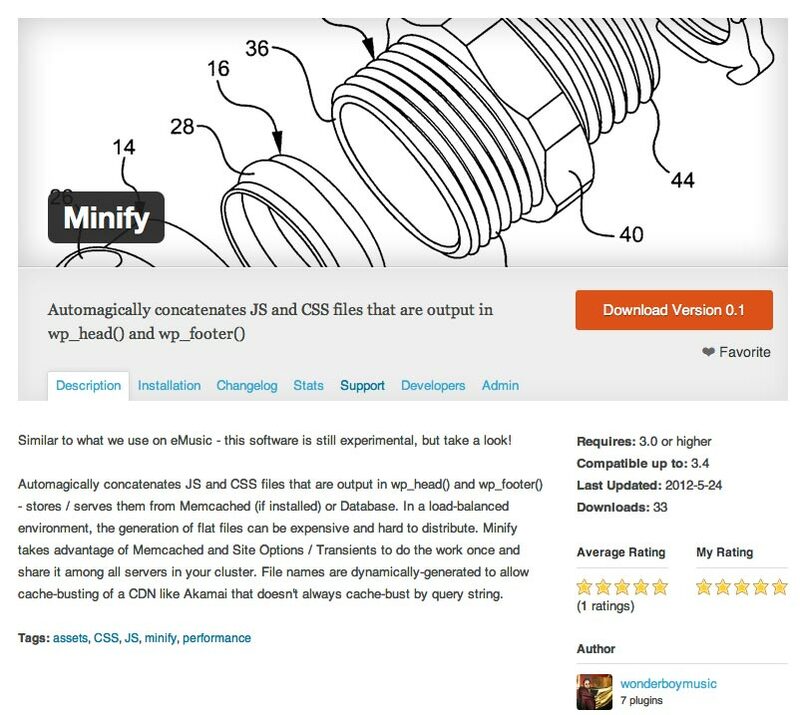 As you may or may not know, I wrote a plugin a while back called Minify. Its purpose was to automatically concatenate your JS and CSS files for you in your WordPress theme. Concatenation and minification are good front-end performance optimization techniques. The thinking is simple: why request 10 files when we can request 1 optimized file? So that plugin existed for a little while, I said nothing about it, 20 people downloaded it, and then it completely disappeared from the WordPress plugin repo – random. As of today, it’s back, and it’s way different. When I originally wrote it, I wasn’t working in a load-balanced environment with WordPress. I was working on one or 2 servers at a time on sites that were inconsequential as far as traffic goes. So initially, I was generating flat files. When you get into the cluster business, you need to give up the notion of working with dynamically-generated flat files. Unless a user is “pinned” to a particular server in the environment, there is no way to determine if you are on the same server from page to page without some logic you shouldn’t feel like messing with – ah, the statelessness of HTTP. When you are on many servers, Memcached is a great conduit for maintaining state and sharing resources. If that is true, why not use it for JS and CSS? As with all static assets, in the end, you are producing a URL that points at data. Where that data comes from shouldn’t matter. It should be produced fast, and if it can be distributed, great. Especially if you are behind a CDN like Akamai, once the data is requested, it will be cached there, where your local flat files aren’t being utilized. A Minify tab is specified in the admin to let you update your Minify increment. This is crucial for cache-busting a CDN like Akamai that won’t always request a new version of the file when the query string changes. The increment is included in the list of files that is stored and the generated source, so updating it will create a new list and new source.